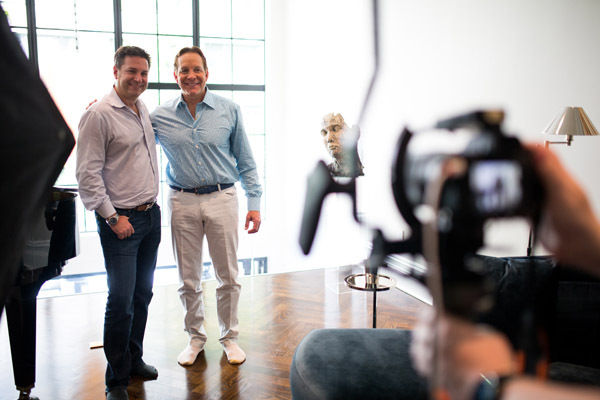 Although Steve Guttenberg is firmly established as the star not only of hit motion pictures but of hit motion picture franchises, his roots are in the theater. As a result, he has moved effortlessly between comedy and drama. In two decades of stardom in both critical and box-office hits, Guttenberg has been the above-the-title star of six films that earned over $100,000,000 in the United States, a feat accomplished by relatively few superstars. He has also starred in four film franchises, appearing in such sequeled smash hits as Cocoon (1985), 3 Men and a Baby (1987), Police Academy (1984), and Short Circuit (1986), taking his films’ box-office grosses into the billions. The comic timing and charm with which he illuminated those films and the dramatic invention which he displayed in such other major successes as Diner (1982), The Bedroom Window (1987), The Boys from Brazil (1978), and a string of historic television films all derive from his firm theater training. Steven Robert Guttenberg was born in Brooklyn, New York, to Ann Guttenberg (née Ann Iris Newman), a surgical assistant, Stan Guttenberg (Jerome Stanley Guttenberg), an electrical engineer. He is of Austrian Jewish and Russian Jewish descent. His studies, which include years with famed teacher Herbert Berghof and with one of the most fertile schools of improvisational comedy, The Groundlings, took him to such renowned theaters as the Helen Hayes on Broadway, where he created the lead role in “Prelude To A Kiss” and “The Comedy” in London’s West End, where he starred in “The Boys Next Door.” He recently won kudos again in the world stage premiere production of “Furthest From the Sun,” which Woody Harrelson directed and co-authored. Guttenberg has carved as vivid a body of work on TV as he has on the big screen. His television films include the critically acclaimed Miracle on Ice (1981), To Race the Wind (1980), Something for Joey (1977), and the controversial nuclear holocaust picture, The Day After (1983), which more than 20 years after its original airing remains the highest-rated made-for-television movie in history. Fiercely dedicated to improving opportunities for the homeless and for young people, Guttenberg has created Guttenhouse, an apartment complex he has funded to accommodate young people after their graduation from foster child status, with on-site social worker direction to assist their assuming adult responsibilities. The Entertainment Industry Foundation, Hollywood’s charity arm, selected him to be Ambassador for Children’s Issues because of his dedicated work on behalf of children and the homeless. In this capacity, he is spearheading Sight for Students, a $7-million program in which, together with VSP and Altair Eyeglasses, he will help provide glasses for 50,000 underprivileged and visually challenged children throughout their school years. Part of his unique ability to Pied Piper children to better lives comes from the fact that he is as affectionately regarded by young audiences as by adults, having starred in such kids’ favorites as Casper: A Spirited Beginning (1997), It Takes Two (1995), and Zeus and Roxanne (1997). His interest in the welfare of youngsters is reflected in his work as a producer and director. He executive-produced “Gangs,” a CBS Schoolbreak Special (1984), which earned an Emmy nomination, and he debuted as a director with another critically acclaimed CBS Schoolbreak Special (1984), “Love Off Limits” (1993). Born in Brooklyn, New York (his production company, Mr. Kirby Productions, is named after his high school drama teacher) he grew up in Massapequa, Long Island. Guttenberg’s crowded spare time includes his charitable activities for such kids-oriented agencies as Friends of the Children/Bridges, The Starlight Foundation as well as the Entertainment Industry Foundation. He is also an avid surfer and golfer and a passionate devoted dog owner. His first film as director/producer/co-screenwriter/star was an adaptation of a Broadway hit, the classic stage comedy/drama P.S. Your Cat Is Dead! (2002) by the late James Kirkwood Jr., co-author of “A Chorus Line” (and, of course, A Chorus Line (1985)). The black comedy, with its frank exploration of sexual role-playing, has lured and defied filmmakers for a quarter-century.